The dreaded thought of leaving the Immersion on is one of our most scary moments. 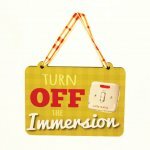 Irish mothers and fathers spend a lifetime reminding us to turn the Immersion. This novel Irish Sign was a favourite one and designed following numerous requests. Turn Off the Immersion Wooden Sign will be packaged securely for posting.